Since more and more airlines offer affordable tickets to an increasing number of countries and with blogs and websites monitoring these special deals, low-cost travelling has become somewhat of a hobby of mine. I have a shortlist of places I want to visit and whenever opportunity arises I go after it. Unfortunately, this type of travelling is often worth it only if you travel light. And that’s why stores like Pod 7 kilo (Less than 7 kg) exist. Perfect for everyone who is a bit of a geek when it comes to gadgets and travelling, this group of travel enthusiasts takes Antoine Saint-Exupery’s quote that “he who wants to travel happily must travel light” as their motto and core business concept. Even though I’ve discovered it only recently I find myself visiting their e-shop with an increasing regularity. From jackets and day-packs, that are the size of a keychain when folded, to miniature tents and sleeping bags, Under 7 kg is sure to catch your attention. It is not cheap, on the contrary, some items are ridiculously expensive (as outdoor equipment tends to be) but there’s also tons of really useful things. For my latest trip I got a large water bottle which can be flattened and rolled up when empty so it doesn’t take up any space at all. Nifty gadget indeed. 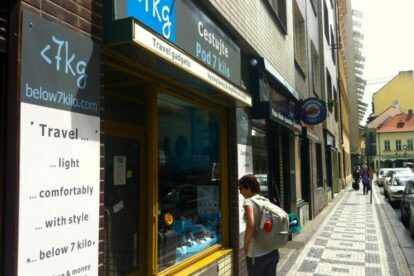 So if you want to free up your backpack for some souvenirs, stop by their store near Náměstí republiky and check out all the lightweight and portable stuff they carry.